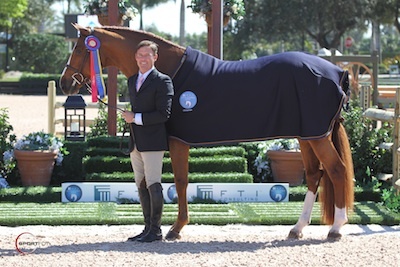 Scott Stewart and Touchdown are the Green Conformation Hunter champions during the third week of the 2011 FTI Winter Equestrian Festival. Photo © Sportfot, Official Sport Photographer of the FTI Winter Equestrian Festival, www.sportfot.com. 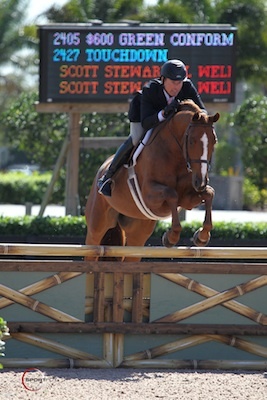 Wellington, FL - January 27, 2011 - The third week of the FTI Winter Equestrian Festival, which runs through April 3, is into its second day of competition at the Palm Beach International Equestrian Center. The Green Conformation Hunters awarded their championship today in the E.R. Mische Grand Hunter Ring. Reserve champion in the Green Conformation Hunter division went to Ken Berkley riding Stormy Good's entry, Harry Potter 47. Harry Potter 47 is a seven-year-old Hanoverian gelding by Harvard. Berkley and Harry Potter 47 won one class, placed second in two classes, and were fifth and fourth in the division's other two classes. Touchdown was recently purchased by Stewart in Germany. "He was doing mostly dressage in Germany and only started jumping in August," said Stewart. Touchdown has clearly found his forte with Stewart in the hunter ring. Stewart went on to say, "Touchdown is the greenest horse I have this year, but he's really easy." Touchdown and Stewart will take a break during week 4 of the FTI Winter Equestrian Festival, but will get back to business week 5. Stewart plans to show Touchdown weeks 5 and 6 with hopes of qualifying for the World Championship Hunter Rider Spectacular Hunter Classic on February 18. A special congratulations is also in order for Tim Goguen on his Boggs Hill entry, Whatever. The pair was reserve champion in the Second Year Green Working Hunters. This week marked Goguen's first time in the show ring since he suffered from substantial injuries in a riding accident over a year ago. Week 3 will continue tomorrow as the amateurs begin competing. Section A of the Low Adult Hunters 2'6" will show in their second day of competition tomorrow in the Rost Arena.